1. Warm the olive oil in a frying pan over a high heat. Add the lardons and cook for 5 minutes, until golden. Add the garlic and chilli and cook for a further 30 seconds until fragrant and soft. 2. Wash the kale and, leaving a little water on the leaves, add to the pan with the wine and beans. Stir fry for 1 minute. 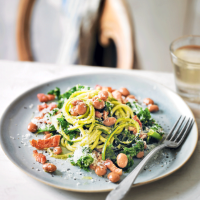 Add the courgette spaghetti and toss gently for 30-60 seconds until piping hot. 3. Add the lemon juice, most of the pecorino and seasoning. Toss together and serve with the remaining cheese sprinkled over and a drizzle of extra olive oil. Delicious with a tomato salad. This recipe was first published in Thu Jan 12 09:58:00 GMT 2017.